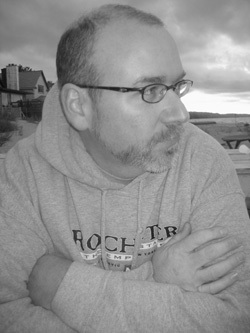 Gregory Gerard's work has been published by Tiny Lights, Jonathan, Lake Affect, and more, and recognized by Rochester's Geva Theater and KRCB radio's Word by Word. He teaches writing part-time at Writers & Books, Rochester’s contemporary literary center, and has been a guest instructor at the University of Rochester's Scholars Creative Writing Program. His memoir, In Jupiter's Shadow, (Infinity Publishing, 2009) chronicles a religious boy's struggle with forbidden attraction. It explores how we all receive messages about what we "should be" in life and how we sometimes work to hide the truth from a most important person in our lives: ourselves. his husband of 17 years.